Dorothy Parker’s well-known verse, published in her 1926 collection Enough Rope, assured readers that they "might as well live." However, this admonition proved impossible for many today in the Southland, as three men turned blades upon themselves in a veritable rash of unrelated suicides. Despondent over poor health and unemployment, Martin Phillips, 42, of 421 W. Second St. slashed his wrists and throat. He was discovered in his house by a fellow boarder, and taken to the hospital; however, Phillips was not expected to live. 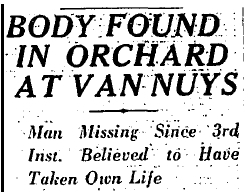 A former employee of the Los Angeles Water Department drove to an apricot orchard in Van Nuys and cut his own throat with a straight razor. Frank A. Howard of 2125 Allesandro Street had been missing since Sept. 3, and was reported to have been upset over his sick child who was confined to a sanatorium. More difficult to understand was the suicide attempt of a young bank clerk, one Donald W. Fraser of Brea. Fraser was employed at the First National Bank there, and on the same night that he slashed his wrists, his boss, M.J. Wolfe, was charged with misappropriation of funds in the amount of $1000. It is unknown whether the incidents were related; however, a bank manager reported that Fraser’s accounts were in good order and that he was on vacation at the time he attempted suicide.